Can the King of R&B be stopped? The answer is NO. R. Kelly has to be the hardest working man in entertainment. The man has had two successful separate tours in 2016, the Buffet Tour and the new holiday themed 12 Nights of Christmas Tour (aka Holiday Jam Tour). 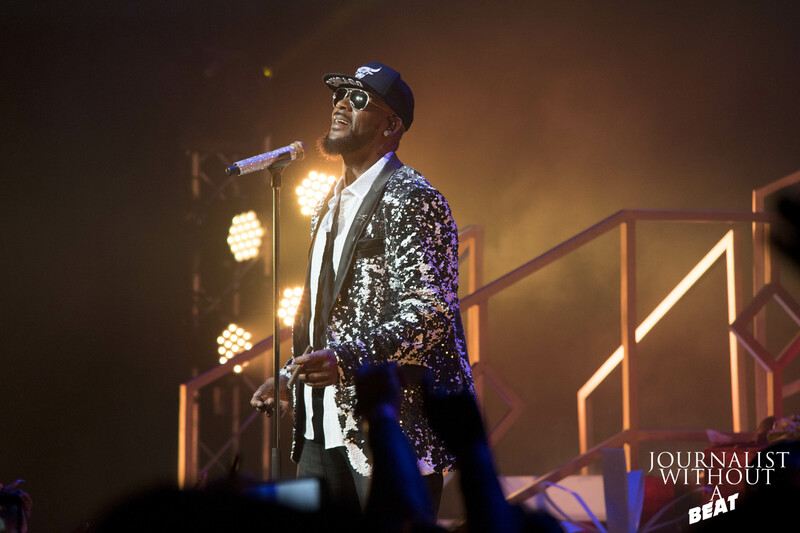 Kellz returned to his hometown on Tuesday for night one of back-to-back shows at the historic Chicago Theatre. The evening kicked off with the #KellzOpeningMic winners Tracy Haynes and 2015 The Voice finalist, Mark Hood. Each was given a solid seven minutes to showcase their talents. Next up was June’s Diary, the all-female group from the BET television show Chasing Destiny. As the curtain was pulled back, it revealed the group, each standing on ladders, harmonizing. All members – Ashly, Brienna, Gabby, Shyann and Kristal descended from the ladders to perform covers of All About That Bass and Love on Top. June’s Diary also performed their break-out single L.A.N.C.E., which the Chicago crowd enjoyed. If you’ve never been to an R. Kelly show, something to note is that Kelly doesn’t cheat his fans from a full experience. From the production to the performance to crowd participation, he wants his fans to be fully emerged and to have them feel as if they are a part of the show. The main event began around 8:50pm. The curtains of the Chicago Theatre were pulled back once more revealing a huge storybook front and center. Two individuals, dressed in winter wardrobe would rush onto the stage and begin to turn the digital pages of the storybook. Kellz voice could be heard narrating the story. As the storybook was taken offstage, R. Kelly himself hit the stage, opening with a wide of range of classics including Home Alone. The crowd loved every minute of it from the get-go. The stage design actually looked as if it was a grand living room, featuring a tall Christmas with all the trimmings, a fire place complete with Christmas stockings, and a bar. Most people in attendance were under the expression that this show would be all Christmas songs, but the Pied Piper let everyone know and stated he was going to sing all the hits and even gave a warning to those who couldn’t take it, stating “Leave now, because it’s about to get freaky than a muthaf***a’ in here”. And he was right, as he went into the Notorious B.I.G.’s 1997 hit, F*** You Tonight. About four people in my row left and never returned. But if they would have waited, R. Kelly slowed things down and performed Home for Christmas from his new Christmas album, 12 Nights of Christmas. Intermissions came in form of short Just Jokes TV skits and an old school song battle, both making a return from his Buffet Tour. As with any R. Kelly concert, it’s a non-stop party, so it’s safe to say these intermissions were greatly needed as all in attendance would take their seats for a brief moment and jump right back up at the sight of Kellz. It’s definitely a workout. At one point during the performance of Down Low (Nobody Has To Know), R. Kelly made his way into the crowd, and to no surprise he was surrounded and grabbed by women. When he returned to the stage, he was indeed missing a shoe, in which he asked politely “Can I please have my shoe back?” The women obliged. It’s hard to choose and determine the crowd’s favorite of night, because the Chicago crowd loved every song that was performed. Sometimes the crowd would be incredibly loud and drown out Kelly’s vocals, so he in turn he would hold the mic out toward the crowd and let them finish. This especially occurred during the melody of Ignition (remix), Fiesta, I’m a Flirt, and You Remind Me of Something. The Chicago Theatre was rocking all night, as the show came to an end with Happy People and Step in the Name of Love. During the last moments of the show, it began to “snow” inside the theatre as R. Kelly thanked Chicago for coming out. As mentioned, the King of R&B does not disappoint when it comes to giving the audience a show of a lifetime. Not only is he a great performer (who sings all his songs in full, no backtrack), he’s all around great showman that knows how to connect with everyone in attendance. When you go to an R. Kelly concert, you’re getting the music you love, comedy (did his own rendition of the internet sensation “U NAME IT Challenge”), and all around great show you will remember for a very long time. From experience, his concerts and the music that is being played connects everyone together even if its only for a 2-3 hours. Highly recommend going out and seeing the last three dates of the 12 Nights of Christmas Tour, you will not be disappointed.